This resort is currently under construction and is expected till about 2019. Builiding 10 is the first to be completed. The pool and rec center are open. The levels of noise can vary from day to day from heavy equipment to finish carpentry. Red dirt can settle on the lanai decking but cleaning supplies are under the sink for guests to use if need be. Construction hours are Monday - Saturday 8AM to 5PM. The regular occupancy for 10B is 8. Guests are obligated to disclose the actual number of occupants prior to arrival. Parking: This unit does have a one car garage for the guests to use. There is also a space in front of the garage for an additonal car for the guests to use. There is a option of additional parking outside the complex on Kaihuna Plantation Rd. Wow, you will not be disappointed in this lovely and spacious 4 bedroom 3.5 bath newly constructed condo! Everything is BRAND NEW! The owners have purchased new furniture, new beds and new linens and have populated the kitchen with everything you will need to make this condo a home away from home! This beautiful condo has desirable upgrades throughout including finishes of marble, granite, hardwood floors, plantation shutters, travertine and much more! 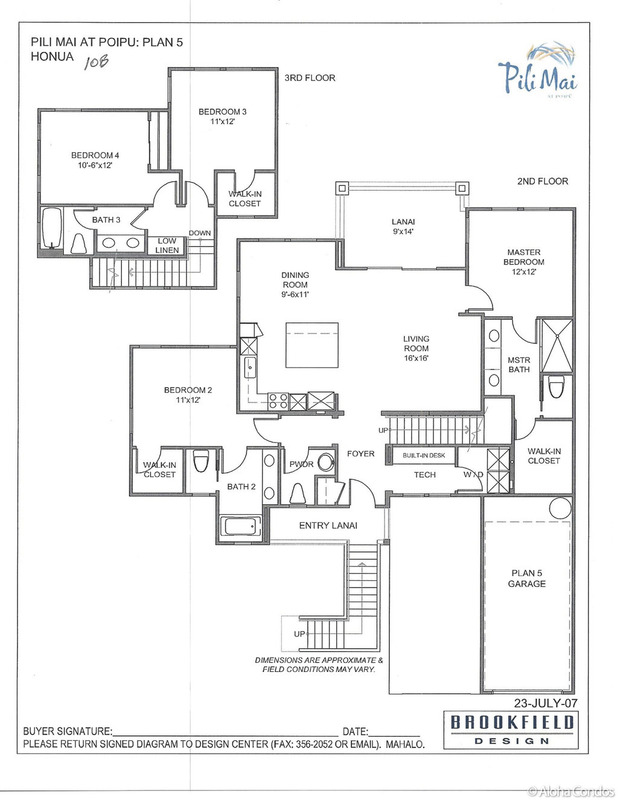 The exceptional layout allows for two master suites with separation from the other two bedrooms on the upper level. This spacious unit can accommodate up to 8 people which is hard to find and better yet the twins can be converted to a king providing 4 king beds in this unit. Located in Poipu, a wonderful vacation destination, you are close to beaches, restaurants, shopping and lots of fun activities. The surrounding golf course, mountains and distant ocean views will add to the experience that will provide memories to last a life time. 4 Bedroom 3.5 Bath with Full Kitchen and Living Areas. What a great place! Had everything we needed from boogie boards to beach chairs! Pool area was just a short walk from condo & wading pool was great for our 14 month old grandson. Walk to golf course clubhouse when we played.Ice machine did not work but was not a big deal. Would definitely stay again, love Kauai . Found this condo searching the VRBO website and it was perfect for our group of golfers as we were playing golf on Friday in Wailua, so was able to do the Costco run for food and beverages needed to the entire weekend.This condo is also conveniently located in Poipu where we played on Saturday and on Sunday before leaving to get back to the airport. The unit was well kept and stocked with everything needed to prepare meals.Would definitely stay here on our next golf outing back to KLauai. Pili Mai 10B was a fantastic place to stay in Kauai. The condo was spacious, clean and new. The location was ideal for activities on the south side of the island. I would highly recommend this to anyone and would be happy to go back and stay again. This home is absolutely wonderful, plenty of space for our family. Its in a great location. Clean and well maintained. Only thing we had a very minor issue was the stove, only one burner was working, all the others kept turning off and on for some reason. We couldn't cook multiple items because of it but certainly its not going to stop us from booking this awesome place again. Looking forward to coming back - hopefully next year! Our stay in Pili Mai, Condo 10B was wonderful!! The condo was beautiful and provided us with everything we needed and more! We truly had all of the comforts of home. We loved and utilized the spacious & beautiful kitchen. We even enjoyed some visits to the nice pool and hot tub on site. The beautiful island of Kauai provided our family with many choice memories! We appreciate so much the warm welcome we felt as we arrived and stayed in Pili Mai. We would definitely return to Pilli Mai, Condo 10B again when we visit Kauai! We stayed in Pili May condo 10B during Spring break. This is everything you can dream of for a vacation rental. The kitchen is extremely well stocked with real good quality cooking pots and pans. Salt, peppers and olive oils are all there. There are more rooms than we can use, but the large space makes me feel relaxed. The patio is very pleasant and has a nice view of the gold course. The surrounding was very quiet. The bed is comfortable, and shower is good. Great value! We loved the layout of the condo, and the space. The two masters on the 1st floor were great. We stayed with our parents and my (2) kids and we always felt like we had more than enough privacy and room. The patio was spacious and we loved watching people play golf and eating meals outside. The pool and BBQ area was clean and just like the photos. I would recommend any guest to stay here during their vacation. Great location with fantastic amenities!! Great place ! Close to several beaches . Great kitchen ! Plenty of beach gear . Highly recommend! Thank you for taking the time to post for us in response to our request. We are happy you found the condo to be a great place and we do appreciate your recommendations! We do hope you can return and enjoy once again! We had 4 family adult couples stay at this beautiful Condo. It was so beautiful and had everything we needed. We cooked all our meals and they had all top of the line in the kitchen that was necessary. The lanai has spectacular views. The A/C was very comfortable. They had lots of goodies in the garage such as chairs umbrellas ice chest body boards etc. We used the BBQ and hot tub and had it to ourselves at the clubhouse. No complaints what so ever. The only thing I could recommend is when the twin beds were made into a king as we were all adults could have used a little more mattress pad as not to feel the two twins as a king. This room also doesn't have a tv or dresser as the rest did. However they did have extra mattress pads in the closet so we took care of that in a jiffy. This condo is located on beautiful golf course grounds very close to the beach and we will be back. Everything was as it should be no issues. Top of the line new and worth every penny! A group of 8 ladies stayed at this condo for a celebratory long weekend and we thoroughly enjoyed our stay here! The space is very spacious and we loved having lots of bathrooms. The open kitchen has a huge island and together with the living room made for the perfect place to cook and hang out. Everything was tastefully decorated and very clean. When we had questions, we were able to get in contact with someone right away. The internet worked great, there were extra beach towels, and the kitchen was well stocked. The location was also great, as it was near many of the places we wanted to go in the South Shore. We also enjoyed the use of the newly opened pool, which was really nice and convenient. Thank you for providing us with an excellent, comfortable stay! We had a great time time at Pili Mai.Our condo was big and bright with lots of room for our whole family,we all loved the large island in the kitchen.The kitchen was well equipped to do any cooking.The resort was peaceful and quiet,a 2 minute walk to the pool.Shopping and restaurants were only an 8 minute walk and the beach 15 minutes,so we were close to everything we needed.Great location to tour the rest of the island.Would definitely come back here again.Thanks for a great holiday! We thoroughly enjoyed our stay at Pili Mai 10B. It was spacious, clean, lovely and had all the amenities we could have wanted or needed. The pool is lovely, and it is just a short walk to the Poipu Shopping Center and a short dtive from e everything else on the South Shore of Kauai. Thanks for your help in making our trip to Kauai so great! We stayed at Pili Mai for 2 nights in October and were really impressed with the condo. It was well furnished and equipped, and had plenty of space for our group. The pool area was fantastic and the kids loved it. The lanai was also lovely. An easy drive to local restaurants and beach. We wish we had more time here! We appreciate your comments about the unit 10B at Pili Mai. It is a great condo and we are happy to hear you agree. The location is also great and close to everything as you mention. The complex amenities are nice with the brand new pool, hot tub and fitness center and gives you nice options for a day of fun. We would love you have you come again! Posting a review for the unit 10B at Pili Mai is much appreciated. We are glad to hear the unit met your needs and you were able to both gather and relax. I will make comment to the complex about possibly opening the fitness center earlier but it is great to workout and take in Kauai on the beach or in the neighborhoods and even on wonderful hikes. Please come back again and enjoy! Great condo in a great location. We had a blast! The Kitchen is well equipped and has everything you need. The pool opened just before we got there and is really nice. The construction is a non-issue and didn't disrupt our trip at all. All in all a great place! We appreciate you great review for the unit 10B at Pili Mai. We are happy to hear you had a great vacation and found the unit well equipped and everything you needed. The new pool is really nice and glad you enjoyed it. We hope you can come back again soon! We stayed 7 nights from July 14-21 2016. We had 6 adults and had more than enough rooms. The views were great, the permanent neighbor below was excellent and the condo pictures do not do justice to the condo. We spent many evenings on the lanai overlooking the golf course for breakfast, dinners and the after dinner drink. Although the recreation area and pool were not open we used the complimentary gym pass at the Poipu Athletic Club almost every day for workouts and who needs a pool when you are on Kauai. We could not have enjoyed our stay more and the courtesy provided by the Aloha Condo staff was superb. I truly enjoyed working with Christine, Kristin and you should plan a problem just so you can talk to Graham. Thank you very much for making our stay memorable and we will be returning. Thank you so much for your great review of the unit 10B at Pili Mai. We are so happy to hear you enjoyed the stay and found the condo to your liking. It is a great condos and very spacious for comfortable living. Thank you for mentioning you were pleased with the staff. We do work hard to keep our guests happy and accommodated. We are so glad to hear you will be returning! We loved staying in Pili Mai Condo 10B. It fit our family perfectly. Everything was clean and in great shape. We loved the location as well. The kitchen was very well stocked with anything we needed. It was so great to have beach towels provided for everyone as well as beach chairs and umbrellas we could use found in the garage. It made our many trips to the beach so nice. I would highly recommend staying here. We loved our vacation in Kauai and the condo added to our perfect trip! Thank you so much for the great review for the unit 10B at Pili Mai in Poipu. We appreicate you noting the unit was clean and in great shape and well stocked. We are happy your vacation went well and you enjoyed the condos. We do hope you can come again soon! Cozy large bedrooms new Condo over looking the 18th hole of the golf course. The house is located close to Poipu beaches and golf courses. Good for families and adults who enjoys the beach and golfing. For exploring the island a little far from the north shore but perfect for Waimea Canyon . We were three adult couples and found the three king beds and bathrooms the perfect base from which to explore Kauai and a delightful place to return and spend time relaxing, playing games and laughing together. The current construction, though right across the driveway, caused us little or no inconvenience as we spent most of the work day hours in the pursuit of tropical adventures, shopping and just relaxing on various nearby beaches. The kitchen was surprisingly well stocked, the large and small appliances are excellent quality and the tableware well above average. The condo was beautiful, clean & conveniently located. This was a ladies trip - we're seniors in our 70's so if anything we struggled a little with the stairs. We would not hesitate to stay at this complex in the future but we will ask you to put us in a one story unit on the ground floor. Thank you - staying at this lovely condo made our visit to Kauai so special. We stayed in 10B, one of the four bedroom units because we were gathering with family for Christmas. This was our first trip to Kauai and our first time staying at Pili Mai. The location and condo exceeded our expectations. After some touring of the island and beach-hopping, we were glad we stayed on the Poipu Beach side of the island due to amenities and sunshine, especially this time of year. We rented a car (expensive!) and were glad we did to access local beaches and other sites. Poipu is a convenient drive from the airport at Lihue and there is great shopping and food nearby. The condos at Pili Mai are first-rate. Brand new and comfortable with all the amenities. We shopped at nearby Costco and Safeway and did a lot of our own cooking in the large kitchen. We lacked for nothing in the way of utensils or dishes, etc. The only pan we needed for the traditional Christmas morning coffee cake was a spring foam pan, which we bought at local store and left in the condo. Oh yeah, I grilled a couple of times on the community grills, but you'll need a lighter as the pilot light is not left on. Can't wait to see the complex when it is completely built out with the pool and clubhouse. We did not take advantage of the local fitness center and pool down the road, but one of our daughters booked a crossfit class there and had a great experience. We enjoyed walking to the beach near the resorts down the street and ate at a couple of the restaurants nearby. Shaved ice, drug stores, clothing, were all available and top-notch. It's all here at Pili Mai. we stayed at this beautiful home for 4 nights. we were actually sad to only get to stay 4 nights. pros: the home was extremely clean. did not see even one bug while we were there. the AC worked well and kept it cool. every bedroom had a walk in closet, which i love because i can put my baby's crib in there without having to be far away but still having space. I also really liked the kitchen stocked with a large variety of tools for almost any kind of dinner you can think of. i especially appreciated the ziplocs in the cupboard as we seemed to always need some. cons: 1) the fridge filtered water was great but the button was broken periodically. the tap water was unbearable. 2) the rug in the living room is not stiff enough to hold its shape even with a stay mat underneath. we tripped over it multiple times a day. 3) the house rules/guidelines/instructions are not in a booklet anywhere. every time i had a question, i had to dig through emails from the last month to find the 1 of 5 that i got from this condo (and the name always escaped me because it's a 3rd party rental company, not the name of the actual condo) and find the list of rules to figure out where to take the trash out (which is not included anyway, fyi, just find the nearest dumpster) or what the garage code was, etc. i'm assuming these are just kinks of it being a new vacation rental and they will be fixed soon. condo was great. Lots of space, clean, and convenient. We've already booked again for November. Beautiful condo with all the details! Our family was lucky to have had the opportunity to stay at condo 10B at Pili Mai the first week of October 10/2016. It was our first trip to Kauai. What a beautiful condo. It was furnished with so much detail. We appreciated all the thoughtfulness put into decorating and providing supplies for the guests. We stayed at the condo for 4 nights. It was so pleasant to return home from a long day of travelling to relax at a comfortable and esthetically pleasing residence. Thank you for sharing your condo! Pili Mai 10b was a beautiful condo with plenty of room for my entire family! We had a wonderful time in Kauai! Graham was so helpful about things to do on the island and places to go!! Thank you so much!! Fabulous condo. Courteous, prompt and helpful on island contact. Combined with Aloha Condos unbelievable rates and the care and maintenance provided to these upscale units the only thing that I can say to prospective renters is to get online at Aloha Condos and book your reservations today. You will be amazed and thoroughly delighted that you did when opening the door to your condo for the first time. Highly recommended. We had a great time staying at Pili Mai for our short staycation with visiting family. There were 7 of us and having the 4 bedrooms and 3 bathrooms made it so we weren't on top of each other the whole time but the large tables and living area allowed us to still congregate when we wanted. Everything is new and updated so it was clean and comfortable to stay there and cook. The pool wasn't available as they're still doing construction but another option was provided right down the road which was a bonus as we were still hoping to use a pool. The only change I would make is the rug in the living room. It slips easily when you step on it and we had a few people who almost completely fell when going to sit down on the couch which wouldn't have been good. Thanks again for a beautiful place! Thank you so much for taking the time to post a review for us. We do always appreciate what our guests have to say. We are so happy that you enjoyed your stay and found the condo to be accommodating and clean. We are glad to say that our guests do have access to the Poipu Athletic Club so that a pool and many other options are available to them. Thank you for mentioning the rug in the living room. We are already taking steps to fix that by getting a pad to place underneath it. We are sure this will solve the problem. We hope you will be able to come back again and stay with us in paradise. We went to Kauai for a funeral and were very fortunate to find this property. We had six adults and two children in our party and the house was perfect with 4 bedrooms and 3 1/2 baths. It was beautifully furnished with everything in new or like new condition. It is close to shops, restaurants and beaches but far enough from the hustle and bustle of Poipu so that it was quiet and peaceful. We stayed for only two days and look forward to going back soon. We are so glad we could accommodate you for your stay and hope you keep us in mind next time for a vacation. The condo is very spacious and accommodating and everything is new inside and out! We are happy that you found it to be located where you could access everything easily. Thank you for your business!